Wow, you should see all the jersey prints Mood has in stock right now. According to George, my new favorite salesperson at Mood, the shipment just came in and it's mostly European. And mostly around $12-$14 a yard; lots of bold colors and designs. This is significant because it's really hard to find decent jersey prints in the Garment District. Stripes and solids yes, not so for jersey prints in rayon and/or cotton. I bought two panels of blue-and-white photo print—a '60s Times Square summer scene—in cotton/spandex. Check it out…. Standing in line for the Theory sale, 261 W. 36th Street. Photo from Racked NY. The miserable week of rain we've been having here in NYC hasn't kept the fashionistas away from all the sample sales that are going on this month. Theory, Louboutin, Lela Rose, Rebecca Minkoff and Rachel Roy are just some of the designers holding sample sales in the past few days. Now wouldn't it be nice if some of the larger fabric stores and wholesalers held sample sales too? You know, take over some empty office space and sell 2.5- to 3-yard cuts of fabric at reduced prices for a limited period. What do you think, readers? We could help them get rid of last season's fabrics, couldn't we? Treat yourself to mouthwatering mini cupcakes at Baked By Melissa, Seventh Avenue (west side) between W. 38th and 39th Streets. Attention fabric shoppers with a sweet tooth, Baked By Melissa just opened a storefront smack-dab in the middle of the Garment District. Melissa's bite-sized cupcakes come in a variety of yummy flavors, including Cookie Dough, Peanut Butter Cup, Red Velvet, Chocolate Chip Pancake and more. Three mini cupcakes for $3. Seriously, fabric and cupcakes…does it get any sweeter than that? Are you good about getting your scissors sharpened regularly? I try to be, since a sharp pair of scissors makes sewing that much easier. Most of the time I use an old-fashioned grinder who comes around my neighborhood when the weather's nice, but those in the know (like Martha Stewart) recommend taking your dull scissors to Westpfal on W. 25th Street (not in the Garment District but close by). I stopped in last week to inquire about prices (approx. $8-$12 per pair, depending on size), and they seem like a nice bunch here. It takes about a day to get your scissors sharpened, so you'll need to be able to come back later to retrieve your pair. I've seen places on W. 38th between Eighth and Ninth that have signs in their windows saying they sharpen scissors. Anyone used these places and had good/bad results? Let us know. Chic Fabrics (225 W. 39th Street) has gone from being one of my least favorite stores in the Garment District to my current go-to store for my summer sewing needs. If you're looking for pretty silk prints or cotton knits at bargain prices, this is your store. In the last two weeks I bought a silk print ($10.99/yd) to make a pair of Isabel Marant style trousers for me, and I scored some navy cotton jersey ($3.99/yd) to knock off a BCBG top for a family member. You'll see names like Tahari and Nanette Lepore on the bolts there. If you haven't been to Chic recently, you owe it to yourself to stop by. 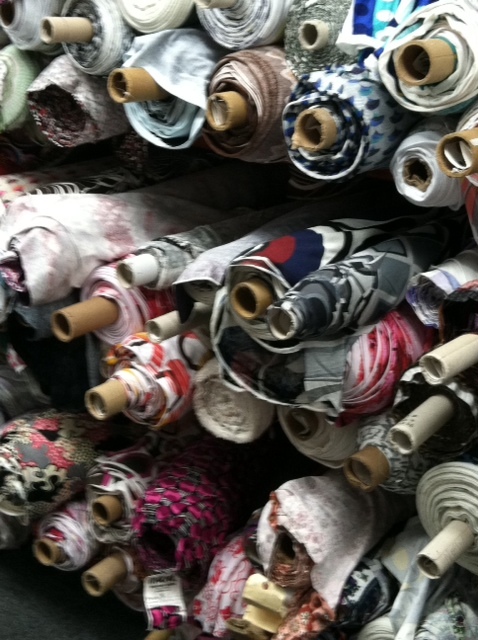 Lace Star is looking for salespeople who "know fashion fabrics." I got an email from the store manager saying they are having a hard time finding people who are qualified (what, you mean not everyone knows the difference between a brocade and a jacquard?). Contact Payam Hezghia, 212-840-0555, if you're interested. Nancy helping a customer with fabric-covered buttons at Steinlauf & Stoller on W. 39th Street between Seventh and Eighth Avenues. If you need snaps, grommets or eyelets installed, or buttons covered with fabric, Nancy at Steinlauf & Stoller is your go-to person. I think she gets the award for most pleasant person in NYC's Garment District. In fact, there's a sign posted near her desk by S&S management warning customers to not take advantage of her sweet disposition and let the poor woman have her lunch break. Cost for Nancy's services range from around $1-$2 per item installed or button covered, depending on size. Make sure you clearly mark where you want your snaps or eyelets installed so Nancy can work while you browse for notions and dressmaking supplies at S&S. Most of the time Nancy can complete your job as you wait, but she does get busy and you may need to return later to pick up your garment. If you've ever tried to install snaps or grommets on your own (a huge pain-in the-you-know-what), you know this is a small price to pay to have Nancy do it for you professionally. Ok, so it's not in the Garment District proper, but if you're heading to FIT or Chelsea you need to stop in this incredibly nifty store located at 245 W. 29th Street between Seventh and Eighth Avenues. Manhattan Wardrobe Supply is where stylists and costumers go to arm themselves for any type of wardrobe malfunction possible. For example, I spent a good twenty minutes alone looking at all the products they have for shoes that are too tight. (I am notorious for buying shoes that pinch. I convince myself they'll stretch but they never do, like the Chanel ballet flats that sit in my closet barely worn.) MWS carries fabric dyes, stain removers, all sorts of adhesives, millinery supplies, a bunch of things that fall under that category of "intimates," garment bags and much, much more.